Hi. Welcome back to www.engvid.com. I'm Adam. Nice to see you again. Today's lesson is for IELTS and TOEFL students, and so because these students need a little extra practice in listening to more natural speed English, I will speak a little bit faster. If you're a beginner English learner, watch anyway. It's still good practice, but don't worry if I'm speaking a little bit too fast. 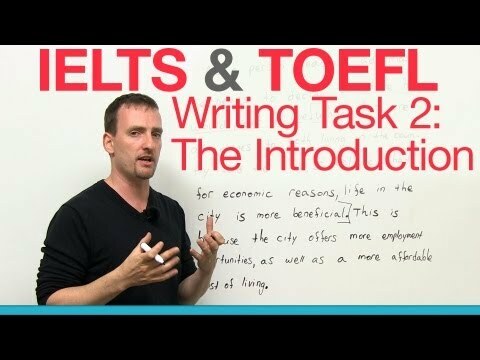 So more specifically, I'm going to be looking at the Writing -- Task 2, the essay of the IELTS and/or TOEFL. They're very similar. That's why I'm doing them together. There're not big differences, but I will point them out. And what I'm doing is I'm concentrating on the introduction today, the introduction paragraph. I'm not showing you the whole essay; I'm just showing you the introduction. Now, you're wondering, "Why? It's just the introduction. It's a short one, right?" No. This is probably the most important paragraph in your whole essay. This is where you, basically, make or break your score, okay? Why? Because here is where the reader understands what you're about to do. This is where the grader -- the person who's giving you your score -- understands if you understood the question; understands if you know what you're talking about; and understands if you knew how to plan well, okay? Very, very important the first paragraph, the introduction. So what are you going to do? Of course you're going to plan first. You're not going to start writing. Do not write one word of your essay until you have your plan ready. Once you have your plan ready, your essay is done. You just have to, basically, translate this plan into sentences. You're basically going for three to five sentences. Less than three, you missed something; you didn't do enough. More than five, you're going for words. You don't have time; don't worry about it. Three to five -- get down what you need to get down. Get into your bodies where you're going to be writing the most, okay? There are four questions you want to answer in the introduction. You will already have these answers once you've planned properly, okay? What do you want to answer? "What is the topic?" "What is the question?" "What is your opinion?" And "What are your reasons?" These are the four things that must be included in the introduction. Now, a lot of you think, "Well, 'topic' and 'question' is the same thing, right?" But no; they're not. This is where a lot of people lose points because they don't realize that these are two different things. The "topic" is the general idea of what the question is about. The "question" is, specifically, what are you asked to do. Now, the most common type of question you will see on both the IELTS and the TOEFL is a question that asks you to choose between two things. They want you to choose one and argue why that one is better than the other one, or why that one is so good. Now, what I'm going to show you today will mostly apply to these types of questions. But if you have a question that asks you to compare and contrast two things, keep in mind even if they ask you to compare two things, they're still going to ask you to lean towards one of them, to choose one as better than the other, in which case you're still going to need to give your opinion, okay? "What is the topic?" You're going to keep this very, very general. All you're doing is giving the idea of what the essay is about. So I know all of you have probably practiced this question: "Is it better to live in the countryside or in the city? Explain your reasons, giving examples, etc." Your first sentence, very, very general: What is the topic of this question? City life? Country life? No. The topic is "where to live". So your first sentence introduces the idea of living -- choosing a place to live. The question is then more specific, so your sentence narrows a little bit, becomes a little bit more focused. The question is: "Is it better in the country or the city?" Okay? Then, you have to give your opinion. You must say, "I believe", "I think", "in my opinion". You don't have to use these words. There're other ways to say your opinion, but if you're not sure of those, put one of those; make it very, very clear what you're saying. This is your thesis. This is a very specific sentence. After reading this sentence, I, the grader, must understand which side you've chosen and what you're going to argue. And then you see the last sentence gets a little bit more general. Why? Because you're giving your reasons. You're not giving me details.